Fat lamb prices rocketed to £116 on Monday. 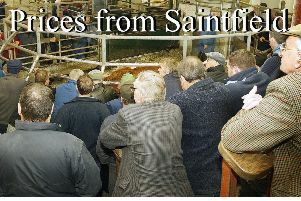 Great demand also for store lambs selling up to £87 and fat ewes £106. Kenneth Hopper £116/29kg, Ashley Bowden £112/26kg, Sean McElhone £110.50/26kg, Raymond Boyd £110/32kg, Nigel Laughlin £110/25kg, Patrick McCrory £110/30kg, Norman McConnell £110/28kg, B Ward £09.80/25kg, Robert Starke £109.80/24kg, Kathleen McLaughlin £109/26kg, Raymond Boyd £109/26kg, Patrick Kelly £109/25kg, Patrick McCrory £107.50/26kg, Samuel Wilson £107/27kg, Kenneth Hopper £107/25kg, Niall Daly £106.50/24kg, M McGurk £106/24kg, Peter Quinn £106/24kg, John Beattie £106/25kg, John McQuaid £105/24kg, M McGurk £104.50/25kg, J Tanney £103.50/25kg, John Blair £103/24kg, P Quinn £101.50/24kg, Sean McElhone £101/23kg and Raymond Bowden £100.50/23kg. James McKernan £87, A McCullagh £86.50, John Beattie £86, Colm McCullagh £85.50, Alan Boyd £85, Francis McClean £84.50, F Kelly £82.50, F Kelly £82.50, C McLaughlin £81.50, David Baxter £72, A McCullagh £71 and Ashley Bowden £65, £60. John Keenan £106, David Hempton £102, John Lowe £90, Ashley Bowden £90, Paul McCartan £88, Stephen Watt £87.50, Ivor Clarke £85, Philip Carlin £83, Charles Boyd £83, Cathal Nugent £82, Victor Laughlin £82, John McQuaid £80, R Irwin £80 and Kenneth Hopper £78.